In Chicago’s 1981 Pride Parade, the crowds cheered the first PFLAG banner, then standing for Parents and Friends of Lesbians and Gays. Every year since, the acclaim has been repeated. The national organization, which was formed in 1981 and grew from a New York group originally called Parents and Friends of Gays, has been known since 1993 as Parents, Families and Friends of Lesbians and Gays. The Chicago PFLAG chapter has its origins in a group formed by Guy Warner when he was looking for support for his mother after coming out to her. Under the auspices of Mattachine Midwest, Warner founded Chicago’s Parents of Gays in March 1977. Several years later, meeting at the Wellington Avenue United Church of Christ in the Lakeview neighborhood, the Chicago group became a PFLAG chapter and attracted parents from all over the city and suburbs. The national PFLAG organization is a nonpartisan, grassroots organization dedicated to the well-being of all gay, lesbian, bisexual, and transgender (GLBT) persons. It is a nonprofit, tax-exempt, mostly volunteer organization unaffiliated with any ethnic, religious, economic, or political group. Today the national organization counts almost 500 chapter affiliates and has its headquarters in Washington, D.C.
• Thousands of families and individuals—gay and non-gay alike—have been supported at chapter meetings. • New chapters formed over the years in Aurora and the Fox Valley, Elgin, Glenview, Hinsdale, the Loop, Oak Park, Palatine, the South Side, Streamwood, Wheaton, and Woodstock. • The Northern Illinois PFLAG Council was created for advocacy and educational projects. • Scholarships for GLBT youth have been awarded annually. Scores of politicians have been lobbied for GLBT civil rights. • Schools and churches have been trained to become safe places for GLBT persons. 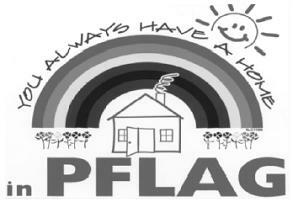 • PFLAG Live!—the first cable television chapter—was established to take PFLAG’s message into the media. A strong and effective voice for GLBT persons and their families and friends, PFLAG continues its mission of support, education, and advocacy, standing as a bridge between the gay and non-gay worlds until fear and unawareness have been overcome. And this October, after a two-year hiatus, PFLAG/Chicago resumed its monthly meetings at Broadway United Methodist Church.